My main focus when we attend a Bible trade show like Christian Product Expo is Bible journaling. I’m not just interested in art journaling. I like the more traditional writing form of journaling as well, and everything that goes along with both types. Wide Margin Bibles are great whether you journal with words, artwork, or some combination of the two. Tyndale had their Scribe Bible on display. While I think paraphrases like “The Message” are better as commentary than for serious Bible study this is a nice journaling edition. One more translation finally has a wide-margin journaling Bible. Abingdon Press had this Common English Bible at the show. Notebooks and Journals are great for notetaking and journaling whether you want to use them instead of a journaling bible or along side one. There were several of various styles on display at the show. Here’s a spiral style with a nice format for Scripture studies. Here’s a blank book-style bound journal from Christian Art Gifts. My daughter and I use this less formatted style more often because the length of our entries vary so much from day to day. We also saw this great book (workbook? journal?) from Crossway. This book is designed to get 8 to 12 year-olds reading and responding to the Word of God. It has a neat retro art style for it’s illustrations. I love that it includes space for the kids to write directly in the book and that it has a full page to encourage them to take notes of the sermon each Sunday. Whether you write in your Bible or notebook it’s always nice to have good pens and pencils for the job. G.T. Luscombe distributes Bible friendly accessories from manufacturers around the world and specializes in pens. Here is a sample page using some of their most popular highlighters and markers. The Pigma Micron is one of the most commonly used pens for writing in Bibles. GTL has recently added both plastic nib Pigma Microns that changes width according to the pressure you use and this ultra-fine tip Pigma Micron to their lineup. We will be reviewing both this ultra-fine pen and the ACCU-Gel highlighters in GTL’s Inductive Study Kit soon and are planning posts of more of their products in the future. 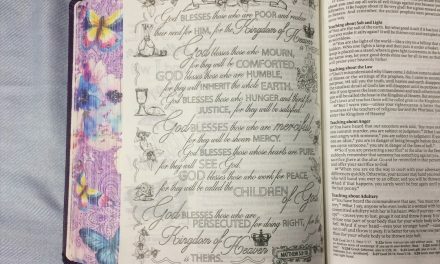 G. T. Luscombe also distributes a wide variety of Bible accessories like magnifiers, tabs, rulers, lots of different Bible art journaling kits, and more. Those of us that art journal always seem to be on the lookout for new craft products. I can’t wait until this new journaling pen set shows up at my local Bible book store. It includes a brush lettering guide and 6 inch ruler as well as a really interesting mix of journaling pens. The pens include a couple of the souffle ink pens, a couple of the glaze ink pens, a couple of caligraphy pens, several pigma microns including a brush tip and a plastic nib one and all of them are Bible friendly. One of the art journaling products I’ve been looking forward to this year is Jann Gray’s Stones of Rembrance. A book, workbook, and One and Done transfer sheet set are available. Stones of Remembrance is all about Legacy Journaling, creating a bible or journal to give to your children or others close to you. The main book is all about the “why” and “what” of legacy journaling and covers a multitude of topics including whether or not to gesso and how to find the right verses. I will have a review for it up in early October. The workbook is more about the “how” and includes step-by-steps for various art styles, a worksheet for helping you find your personal “stones”, and tip-ins and transfer sheets in the back. The review of the workbook (and maybe some samples of my work using it and the transfer sheets) will be later in the year. 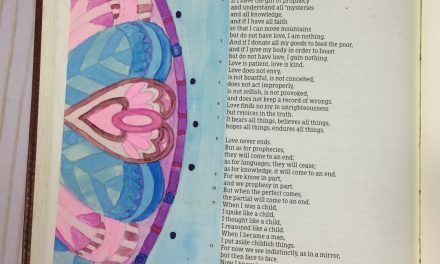 No Bible art journaling list would be complete without a mention of at least something from Illustrated Faith. IF and Dayspring just released these journaling kits that give you a nice start on many of their new journaling lines. One kit that isn’t pictured here is the larger new Created to Create Kit that includes the original devotional of that name. Here’s an example of what comes in the new kits laid out and easier to see (This is the Advent Kit and this picture was borrowed from the Dayspring website with permission). Last but not least a few illustrated journaling Bibles we were allowed to take pictures of. 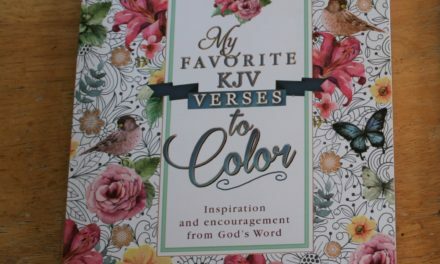 Here is the Large Print Beautiful Word Coloring Bible. The interior is a scaled up version of the original Coloring Bible and it has this lovely new cover. The Canvas Bible has been out for a few months but this was my first chance to see it in person. This is “The Message” version of the Bible with drawings and room for your own work. The makers of the My Creative Bible will be releasing a new illustrated edition called the My Promise Bible that is just as beautiful and usable as the first. I really had a lot of fun checking out all the bible Journaling products at the Christian Product Expo. Which of these products are you looking forward to? Which category of products would you like to see us focus the most heavily on? Let us know in the comments. For more about Munce Group‘s Christian Product Expo (CPE) you can see the overview post and the Bible post.